PediaSwim I: Basic Training | SouthWest Aquatics in Orlando Florida. PediaSwim I is our Basic Infant Survival Training Course. It is our Basic Training Course for infants, toddlers and children. Infants, toddlers and children will learn appropriate swimming postures to allow them to swim facedown in the water, rotate onto their back to a floating position that enables them to rest and breathe, then return to a facedown swimming posture. This sequence of swim-float-swim can be continued until a desired location is reached. This important skill will prepare your child should he/she accidentally fall into the water. 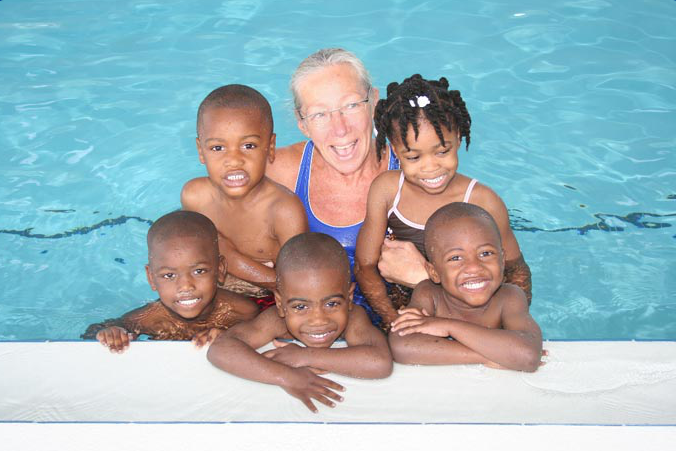 Children also learn to swim between adults, pool steps and the pool edge for fun and recreation. For fast skill development, basic training lessons are scheduled five (5) days a week, for approximately 4 weeks, depending on the student’s previous swimming experience. Completion time for these skills is dependent on consistency in lesson attendance. After a child can successfully complete the swim-float-swim sequence on their own, the basic training instructor simulates a full clothes check out. The clothes check out gives the child practice and experience falling into the water wearing winter clothes and shoes. Once the child has excelled in this area, they may go on to maintenance or stroke development. Once your child has completed PediaSwim I and can happily demonstrate swimming and floating, they will go to PediaSwim II or PediaSwim III. PediaSwim II is for children ages 7 months to 3 years. PediaSwim III is for children ages 3 and up. This is the first place after three different swim instructors over three different summers that finally got Lauren and Austin swimming and floating and swimming again. I highly recommend! We are lifelong customers now. Much love to swim instructors Christine and Greg. You have taught my children a priceless skill.